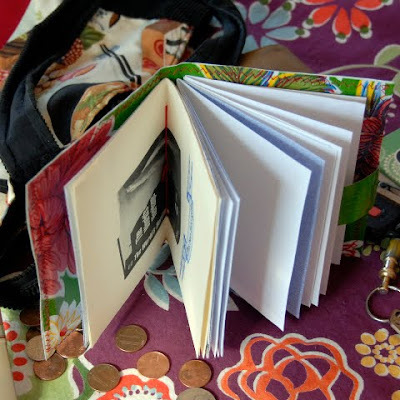 Our next swap book is from Anna, of Purplebean Bindery. Anna says, "my sister-in-law who carries old envelopes around with her to jot down phone numbers, good hiking trails and bakery recommendations inspired these little notebooks. I've bound used envelopes into a festive vinyl notebook sized to fit in her purse. 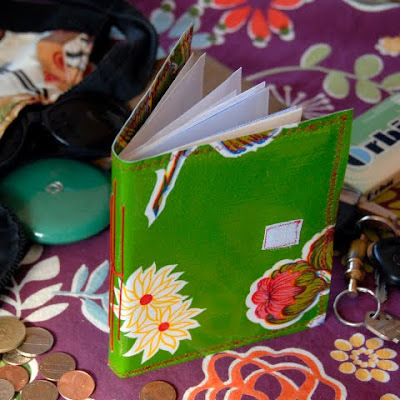 This notebook is sturdy and colorful, wonky and jolly, useful and upcycled. The envelope pages come complete with windows, canceled postage stamps and 'urgent' advertisements, which will necessitate some creative note taking or make those of us who scribble notes on whatever's on hand feel right at home. The cheerful vinyl cover is held closed with a Velcro strap and the exposed long-stitch binding adds a decorative element." Check out PurplebeanBindery.Etsy.com to see more of Anna's work.